A good kitchen faucet should be high in quality, attractively designed and reliable enough to deliver water consistently for as long as it can. Finding a good kitchen faucet is however not difficult. The challenging part is that most of the best kitchen faucets you find on the market are too expensive. And as you probably have it in mind, an ideal kitchen is one that that is affordable, and efficient as well. But then, where can you find an ideal kitchen faucet for your home? Well, try balance faucets. 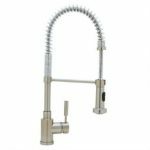 With unparalleled quality, precise craftsmanship from Europe and stunning designing, Blanco kitchen faucets offer a rare chance to get all the qualities and services you would wish from a kitchen faucet at an affordable budget. Read the Blanco faucet reviews below, therefore, to learn about some of the best tools that could add beauty and offer great services to your kitchen for the next number of years. The Blanco Culina combines good styling with high performance for a completely satisfactory experience while in your kitchen. 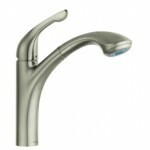 It is one of the few nickel finished faucets that could really fit in whatever interior décor you have in your kitchen. Read below for some of its most unique features. 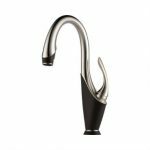 The Blanco Culina takes a U-shaped spout design that is well graced by the sleek closed coil, a well streamlined handle, and an inlay a magnetic spray that lays by it side. 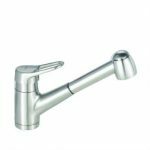 On the other hand, the faucet is founded on a strong stainless steel material that guarantees a long service life as well as protection against rust, corrosion or even dirt. It is also worth noting that it only weighs 3 pounds. Still, the brass made tool measures 6*6*6 inches. To start with, the faucet delivers water at a rate of 2.2 Gal. per minute, which implies that you could practically wash all your dishes and vegetables in the quickest time possible. In addition, its color coded hot water supply lines and a metallic made ceramic valve makes efficiency even better. On the other hand, the Blanco Culina has a very tight and long pull-down hose meant to add convenience while washing anything outside of your kitchen sink with ease. It also comes with a spray wand remember, and has a toggle switch button to help you toggle between streaming water and solid flow movement. In addition to a lifetime warranty, the Blanco Culina also comes with a magnet that holds the wand spray in place whenever you don’t need it. 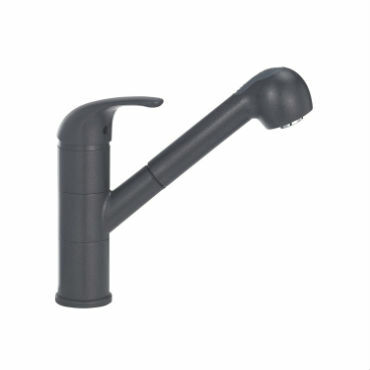 Finally, the faucet’s flexible steel spring spout makes swiveling and using it even better. The Blanco Meridian Semiprofessional faucet takes a U-shaped high spout that is made to look stunning by the closed spring layered coil and the satin nickel finish. When it comes to performance, the Blanco model performs exemplary well for the less than $400 priced kitchen tool. 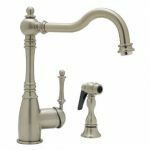 With a solid brass construction, a pull down hand spray and a great satin nickel finish, this faucet represents everything you would ask for in such a device. The construction guarantees a long life as expected while the great performance ensures your kitchen doesn’t look dull or boring. Still, the faucet’s performance is stellar as you are about to see. With a spout reach of more than 8 inches and a water delivery rate of 2.2 Gal. per minute, this faucet is a great make. And besides the great water delivery rate which is, by the way, consistent in at all times, the faucet does come with a pull-down spray that can easily be attached into position when you don’t need it. On the other hand, a ceramic disc cartridge ensures that you can switch between cold and hot water easily and conveniently. 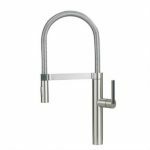 And when you feel like cleaning vegetables or your kitchen altogether, the faucet offers you a reliable and strong supply line that reaches over 20 inches long. The Blanco semi-professional model is quite long with its more than 19 inches long height, but it is also a great performing and quite a reliable kitchen tool. In online Blanco faucet reviews, this faucet has often done well, and not just because of the limited lifetime warranty of great water flow rate, but because it is a greatly constructed faucet. As stated above, the faucet is made out of brass for great quality that won’t get affected by rust or any form of corrosion. It takes one hole for installation, a single lever for better usability and a pull-out spray that works great with its small protruding design. But while the loop handle looks good, it can’t be said to be the best designed. All in all, this faucet is still a great performer. The classic nouveau offers a consistent water delivery rate of 2.2 Gal. per minutes, and a spout reach of about 10 inches. Surprised? Well, this is a faucet anyone who feels bored by the high arc U-shaped faucets should consider. Installing the faucet as reviewed by many people is also easy. Other notable features with this faucet include a ceramic disc cartridge for better efficiency, a single hole construction when it comes to installation and a limited lifetime warranty. If you love luxury faucets, here is one model that could make you kitchen look fabulous. The Blanco Linus, with an activated dual spray mode and a unique right angled spout, can complement almost any type of interior décor you have. 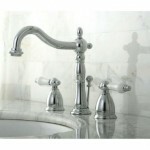 Surprisingly, the faucet costs less than most other luxury faucets you have seen. And when it comes to performance, this faucet is the real deal. 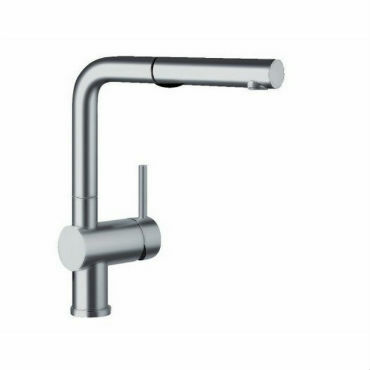 The Blanco Linus faucet takes a contemporary right angled design that is made to look stunning by the sleek satin nickel finish and stylish handle. 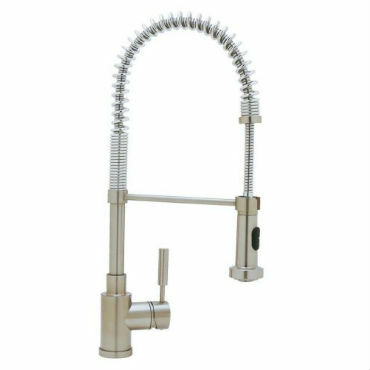 The faucet has a brass construction for long durability and high quality and contains a 3600 swiveling spout for added convenience. And as you will see below, the faucet performs exemplary well thanks to the great craftsmanship of Blanco’s skilled workers. With a water flow rate of 2.2 Gal. per minute, a convenient spout and an easy to use lever, you can perform any cleaning chore in your kitchen with utmost convenience and speed. As if not enough, you have even better convenience when washing vegetables with the stream water flow mode, or while washing the pots with a solid water flow mode; all thanks to the spray wand a button that controls the above mentioned function. It also doesn’t matter what size or type of a sink you have in your kitchen because the Blanco Linus’s design and performance are designed to suit every home owner’s needs. Other notable features with this faucet include a low lead compliance certificate, a ceramic made disc cartridge, and a limited lifetime warranty. The Blanco Torino is as great as you will hear people say about it. Good looking with its stunning design, the perfect harmony of features, standard size, great performer, low maintenance faucet and stylish enough to add aesthetics to your kitchen. 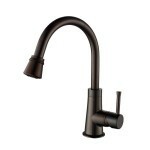 Many Blanco kitchen faucet reviews also praise the faucet which surprisingly costs about $200. With a brass made construction and a pullout spray, this faucet already promises to be a high quality device. Its single lever design, when combined with the unique shape of its spout, makes the Torino look luxurious. And as earlier stated the faucet isn’t big in size. It measures 6*6*6 inches and has a weight of around 9 pounds. While the anthracite color and great design of the Blanco Torino make the faucet look appealing and attractive, it is the incredible performance that makes you feel like buying the faucet at first sight. For starters, it offers a 2.2 Gal. per minute water flow rate, a consistent water spout reach of almost 8 inches and a cartridge to make accessing hot and cold water easier and more convenient. Again, this faucet has a quite convenient pullout spray that falls into place once you are done using it. Its convenience in offering a stream like water flow is also worth noting. The faucet’s color-coded hot and cold supply lines ensure you install the faucet fast and easily. On the other hand, the Blanco Torino does come with a limited lifetime warranty that guarantees you are buying a quality and reliable product. 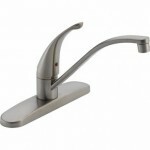 With one of a kind design, the Blanco Grace Kitchen single handle faucet is a stunner. It features well curved and sleek curves, a unique spout design and a side spray meant to make your cleaning chores convenient and easy. The faucet is also inexpensive and promises a long service life. The solid brass construction is only half of what makes the Blanco Grace Faucet a high quality kitchen tool. With the reliable European craftsmanship, the faucet promises a life of no leaks, no corrosion or rust problems. In addition, a great and unique design means your kitchen will look elegant and attractive irrespective of your interior design. Overall, this faucet has a 12 inches spout height, more than 8 inches of aerator clearance and a weight of about 9 pounds. The satin nickel finish not only makes the faucet look elegant, it is also strong enough not to tarnish and make your faucet look ugly over time. On the other hand, you can access and fill your dishes and pots fast and easy thanks to a 2.2 Gal. per minute water flow rate. Still, the faucet has an impressive water spout reach of 9 inches. And to make it an even more convenient tool, the faucet comes with a metal made side spray, a ceramic cartridge, and a spray. 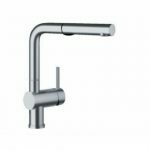 Other notable features with this faucet include the 2 installation holes, extra-long supply lines, and a limited lifetime warranty. They have great designs. Blanco manufacturers are great designers in their products, and the kitchen faucets reflect that greatness. The finishing and sleek curves also reflect the great craftsmanship these faucets have to go through before being availed in the market. They are great performers. As noted above, almost all Blanco kitchen faucets deliver a consistent flow of water at a rate of 2.2GPM. Still, their spout reaches and sprayers are made for great satisfying performances. They are reliable and convenient. With 3600 swiveling spouts, great magnetic sprays, and a strong brass construction, you can rely on these faucets to perform efficiently for many years. They offer a limited lifetime warranty. They don’t offer a wide variety of colors with their faucets-Most of the Blanco faucets come in either satin nickel or chrome, and as such don’t really feel convenient enough to someone who values other finishes. If buying a faucet that guarantees great value for your money is something you believe in, then Blanco faucets can come as great choices for you. And as you may have noted in the above Blanco faucet reviews, these tools offers almost every feature you would wish for in a high quality faucet. That means that not only do you get the elegant designs you wish you could get, you also pay less money for a faucet that will serve you efficiently and satisfactorily for a longer period of time.